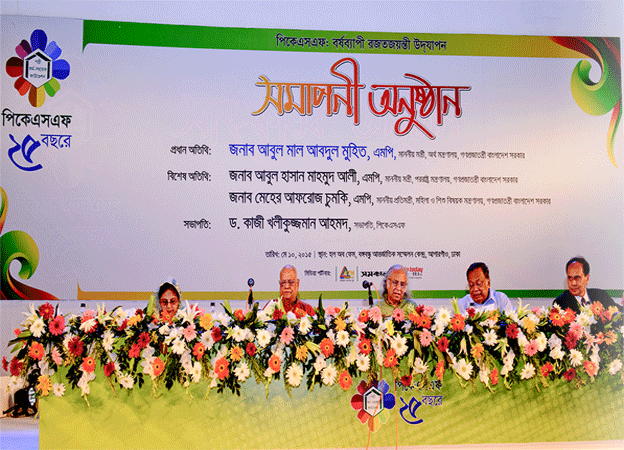 PKSF silver jubilee celebrations came to a close with a day-long programme at Bangabandhu International Convention Centre, Dhaka. It began exactly one year ago. In the beginning, it was a week-long celebration that featured seminars on critical development issues, workshops, cultural presentations and above all, a festive development fair. Then throughout the year, the vibrancy of the of silver jubilee activities was reflected in the organization of a number of seminars held in between and through a number of publications. Presided over by Dr Qazi Kholiquzzaman Ahmad, Chairman, PKSF, the dais of the closing ceremony saw a galaxy of important personalities. Mr Abul Maal Abdul Muhith, MP, Hon’ble Minister, Ministry of Finance, was present as the chief guest, while Mr Abul Hassan Mahmud Ali, MP, Hon’ble Minister, Ministry of Foreign Affairs and Ms Meher Afroz Chumki, MP, Hon’ble State Minister, Ministry of Women and Children Affairs attended the ceremony as special guests. Mr Md Abdul Karim, MD, PKSF delivered the welcome speech. All senior officials and staff of PKSF, representatives from Partner Organisations (Pos) across the country and invited guests representing the Government, development circle and various strata of the society attended the ceremony. One special feature of the closing ceremony was the felicitation of two eminent persons who were honoured with life-time achievement for their valiant involvement in our glorious war of liberation in 1971. They were Mr A M Sharfuzzaman and Begum Mushtari Shafi. Moreover, as many as 1583 students were awarded scholarship for their academic proficiency; they belong to the disadvantaged families of the programme participants of PKSF. The ceremony came to an end with a fascinating cultural soiree.